Large crowd at first ALP community forum on the TPP shows there’s widespread public concern about direction the Coalition government is heading with the 12-nation agreement, and ISDS. Despite the frigid evening temperature (down to -5 overnight), a large crowd turned out to a federal ALP-hosted, night community forum on the Trans Pacific Partnership held in a suburban Griffith community hall in Canberra on 2 June. The TPP is a trade agreement being negotiated among 12 nations: Australia, Brunei, Canada, Chile, Japan, Malaysia, Mexico, New Zealand, Peru, Singapore, the United States and Vietnam. Photo: Craig Emerson and Gai Brodtmann at the meeting. MPs Alannah MacTiernan (Perth) and Gai Brodtmann (Canberra) were moderators. Speakers included Doctor Pat Ranald, research associate at Sydney Uni and convenor of AFTINET; Craig Emerson, former Minister for Trade and Competitiveness; and Jim Chalmers, current Shadow Parliamentary Secretary for Trade and Investment. 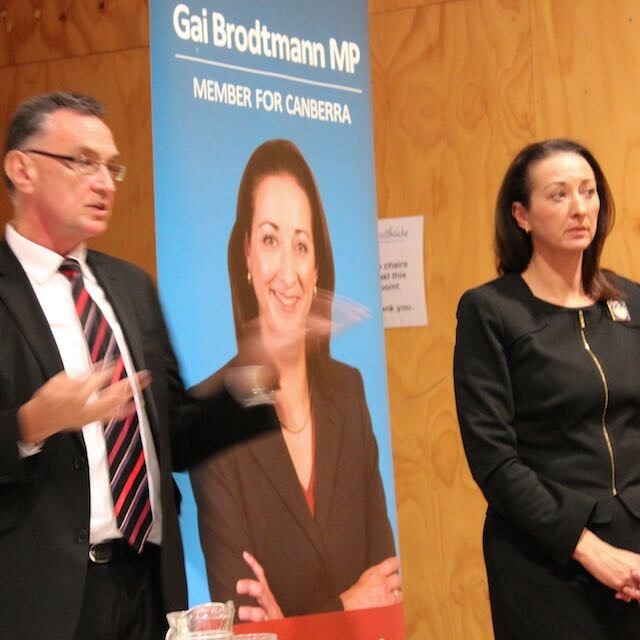 It was encouraging for concerned TPP watchers that the ALP had finally decided to open up a dialogue with the public. This followed the welcome establishment of an inter-party committee on the TPP, consisting of Melissa Parke MP (ALP, Fremantle), Senator Peter Whish-Wilson (Greens, Tas), and Senator Nick Xenophon (Independent, SA). In her initial address and subsequently in answer to questions, Dr Ranald gave a comprehensive account of the main areas of concern regarding the TPP. Dr Ranald pointed out that she was not approaching the TPP from an anti-trade viewpoint, and that indeed she had studied and taught about trade policy for many years. However the TPP is not a free trade agreement, it is actually in part, a preferential trade agreement: of the 29 chapters, only five deal with trade. Indeed, many see the agreement as primarily designed to strengthen the monopoly power of large US corporations, many of which helped to draft the text and continue to be heavily involved in the negotiation process. The other chapters deal with changes to domestic law and regulations which member countries will be required to implement, and with the infamous Investor State Dispute Settlement (ISDS) provisions. ISDS allows foreign corporations to sue governments of all participating countries for passing or possessing laws, policies or regulations or taking actions which may adversely affect company profits. Such cases are heard in offshore tribunals (not courts) made up of, in the main, corporate lawyers, who are not bound by precedent, and whose decisions cannot be appealed. As illustrated in the current Philip Morris case against the Australian Government for “copyright infringement” over Australia’s plain packaging legislation, the decisions of these tribunals may overturn those of the highest Australian courts, and of the Australian Parliament. It is worth mentioning that, although only the federal parliament will have the opportunity to vote on whether or not to ratify the agreement, state and local levels of government will also be vulnerable to lawsuits pursued in these off-shore, unaccountable tribunals. Although some have claimed that there will be economic gains from the TPP, Australia has already lowered its tariffs and we have existing trade agreements with all but three of the TPP countries, Canada, Mexico and Peru. No cost-benefit analysis has been carried out by the Australian government, but the Productivity Commission has cautioned against bilateral and multilateral free trade agreements such as the TPP. Furthermore, an analysis by the US Department of Agriculture (Agriculture in the Trans Pacific Partnership, p. 21) found that, despite gains in a couple of agricultural sectors, Australia will experience no net benefits in GDP growth up to 2025. This begs the question as to why it is worthwhile for us to give up so much with so little to gain in return. restrictions on government regulation on labelling food alcohol and tobacco, which may include barring country of origin labels or listing of ingredients. The TPP may also mandate model legislation which may lower environmental protections and working conditions. Of course, the prospect of ISDS cases will add a chilling effect on government reregulation in all these areas, and possibly others as well. Although some of these measures have been touted by the US government as raising standards, the practical impact for countries such as Australia will likely be lowered standards. In the case of TPP countries which currently have weaker standards, there appears to be no provision for oversight or enforcement. The net result may well be a general lowering of regulatory standards. These provisions will impact on our democracy and our sovereignty, as our government would ratify the agreement without a mandate from the public, and laws passed under the framework of the TPP would bind Australian governments into the future, irrespective of political hue. There is strong public opposition to the TPP within the US and in many of the participating countries. In the US, where (unlike Australia to date) opposition is mainstream and vocal, the viability of the agreement will depend on the Obama administration being able to pass Fast Track (allowing passage of the treaty without widespread Congress debate). So far, it has been passed in the Senate, but there appears to be much more opposition in the House of Representatives, overwhelmingly from the Democrats, who see it as benefitting only corporations and as a job-shedding measure, and from right wing Republicans. Other countries will not sign the TPP unless the US manages to pass the Fast Track provision. This is because otherwise the US Congress would be able to amend the text, during debate, even after other countries have signed it. A major concern is the process, as the text will be signed in the Australian Cabinet without input from the Parliament. Only after it is signed will Parliament have a chance to study the voluminous text. At that stage, Australia and the Australian Parliament will not be able to make changes. For ratification to take place, Parliament will have to pass enabling legislation. Curiously, both Labor men apparently felt the need to state that they stood for free trade, and they thought that would run counter to the mood of the room. One wonders whether they had accepted Coalition Trade Minister Andrew Robb’s line that critics of the TPP were by definition anti-free trade scaremongers. However, from the questions asked, it became clear that audience members were well-informed, and the questions they raised were above all about the lack of economic benefit, the non-trade aspects and the lack of transparency in the process. On the whole, the forum was a welcome development and hopefully will facilitate constructive dialogue between members of the public and the Parliament. * Pauline Westwood has become of the best-informed Australians on the TPP agreement, after developing and maintaining a bibliography and news alert service of leading TPP articles nationally and internationally, for the past two years. She is a member of Civil Liberties Australia.